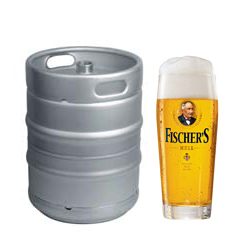 Fischer’s is an excellent example of a Bavarian lager, golden yellow in colour with a malty, hoppy and long aftertaste. It has a very smooth, voluminous beginning, pleasant malt note and an intense fizz which enhances the complete character. A hint of hops provides for the right amount of edginess without being too direct. A true Bavarian pale lager, or Helles as it is now called in Bavaria, and indeed throughout Germany.